Original oil paintings with the process described by the artist. Paintings are for sale, and the process is educational. 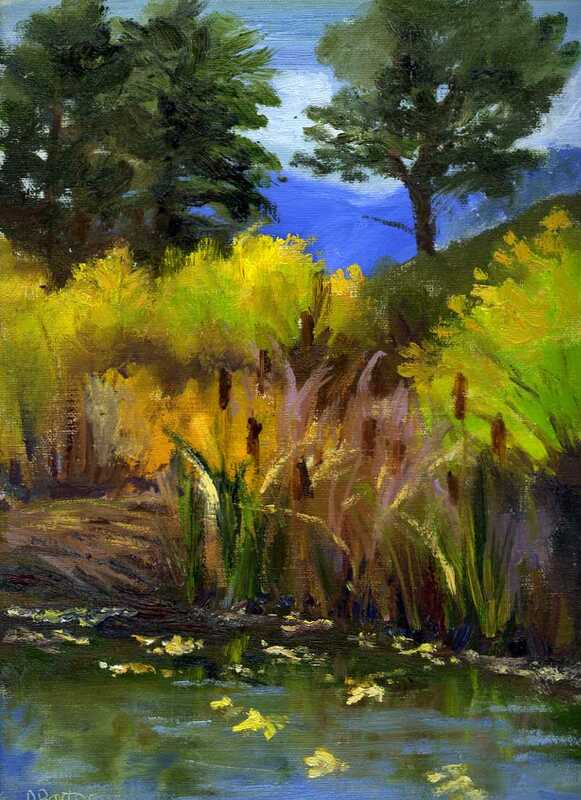 Molas Lake 16 x 20 oil painting. Just reworked this from an artwork I did years ago that had paint splatters on it. I thought it was ruined, but was able to recreate a new season (fall) in new colors as I painted over it. The original painting was done in spring colors, so changing it up was a fun challenge! I think the new version adds more depth to the mountains with the reflected light. I love the big skies of the West and this one is 30 x 40 on gallery wrap canvas. for awhile due to other life concerns. This is one that is not going out of style. It's a window on a big world with hopes and dreams for a New Year. We have amazing clouds over the Front Range and I'm working on a series of large format landscapes that are really cloud-scapes. The land is there to ground the sky, but I have traveled so much across the valleys between mountain ranges where you get such a feeling of open space, this is my attempt to share that feeling of expansive freedom. "Sunflowers with Barn" is a 14 x 18 oil I painted the last day of August at RockLedge Ranch in Colorado Springs. and a few cat tail leaves as well as the fallen leaves on the pond. Rock Ledge Ranch, again. 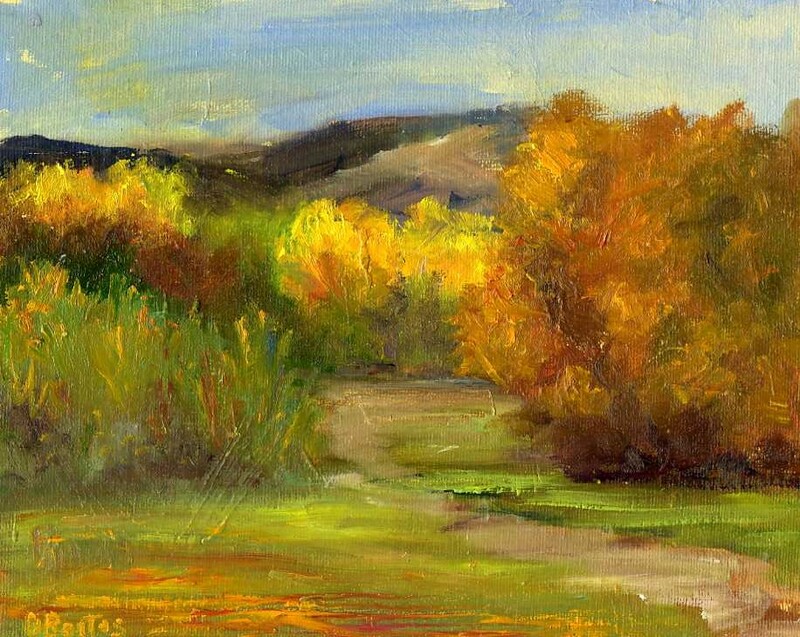 "Evening Light" is an 8 x 10 oil completed on location while standing by the Rock Ledge Ranch Mother's Chapel. 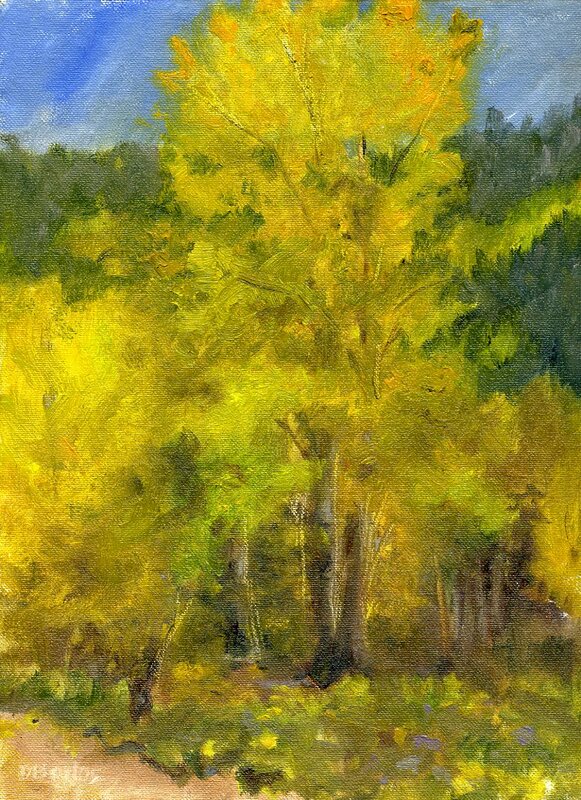 The light was changing fast as the sun was going down, so while I finished the scene, I had to hold in memory the bright colors of the aspen in the background being lit by the diagonal rays of setting sun. is a 9 x 12 on location at Independence Pass the last week of September. Beautiful drive, sun was in and out of the clouds, the contrast between back lit aspen and the rest of the surrounding landscape is too much range for a camera to capture well. These were in the shade of a large cloud when I painted them and allowed for more subtle variation in color. 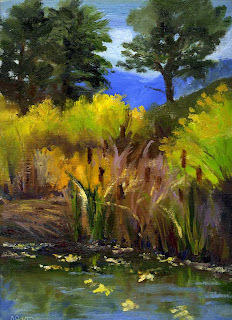 Painting on location with all the sensations of sounds of birds, passing cars, breeze, changing light, hikers with dogs and kids passing by, even bugs and curious wildlife, adds another dimension of life to my work. Same old saw, the more you look, the more you see. The more there is to see on location! Finally, able to post another blog note, after a long frustrating time of computer confusion. 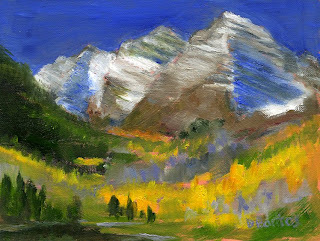 This is "Snowy Bells" of a trip to Maroon Bells 6 x 8 oil painting done on location the last weekend of September. Yes, I'm still painting! Still traveling whenever I can and painting the beauty of nature! to get a photo reference. I've always wanted to paint and travel, live a creative life.